Their first goal was to compare DNA methylation of live brain tissue to three peripheral tissues: blood, saliva, and buccal epithelial cells. They collected blood traditionally, used swabs to collect buccal cells, and used Oragene to collect saliva. Methylome assays were performed and the overall levels of DNA methylation correlation was calculated from the average methylation across subjects for each tissue using Pearson’s correlation. Figure 1. Braun et al. Genome-wide DNA methylation comparison between live human brain and peripheral tissues within individuals. Translational Psychiatry. 9:47 (2019). When the peripheral tissues were compared to the brain, high levels of correlation were observed. 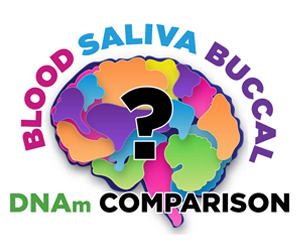 Genome-wide DNA methylation of saliva was significantly more correlated with DNA methylation in brain than blood or buccal tissue. The second goal of the study was to provide a resource for psychiatric/neurological DNA methylation studies that rely on peripheral tissues. They did this by investigating brain – peripheral tissue correlations of genes with variants involved by Genome-Wide Association Studies (GWASs) of Schizophrenia, Bipolar Disorder, and Major Depression Disorder (MDD). To learn more about saliva collection from Oragene, please click here. Smith et al. 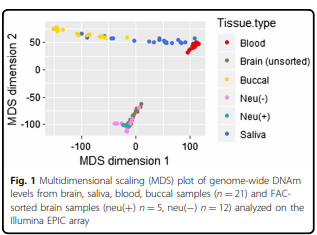 DNA extracted from saliva for methylation studies of psychiatric traits: evidence tissue specificity and relatedness to brain. Am J Med Genet B Neuropsychiatr Genet. 0(1): 36-44 (2015). Braun et al. Genome-wide DNA methylation comparison between live human brain and peripheral tissues within individuals. Translational Psychiatry. 9:47 (2019).